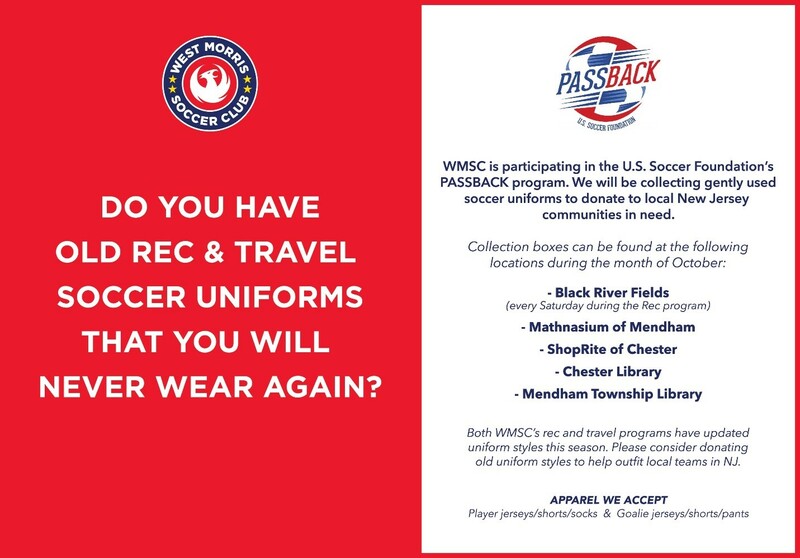 This October, West Morris Soccer Club is participating in the U.S. Soccer Foundation's PASSBACK Program. We are collecting gently used soccer uniforms to donate to local New Jersey communities in need. All player and GK uniforms (apparel only) will be accepted. Both WMSC Travel and Rec programs have updated uniform styles this season. Please consider donating any OLD uniform styles to the PASSBACK Program. *** Please hold on to any cleat donations, as a local Girl Scout will be holding a cleat drive at our Rec Halloween end of the season celebration. Details to come.